I support Emergency and what about Minister Frattini? 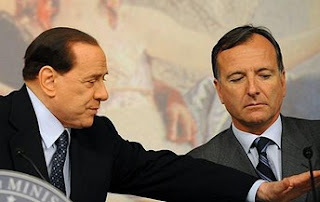 April 11, 2010, after the confession hoax released by the Times: "I pray that is not true, it would be a shame for the Italy. There are facts… very dangerous weapons were found in a hospital by Emergency. We all want to know the truth and we want to know it as soon as possible." Yesterday, about 5 p.m.: "I see rage, grief and sincere astonishment in the three Italians vicissitude. But we have not abandoned them: their presumption of innocence, along with our commitment made by the Afghan authorities to respect their rights, still apply. They are Italian citizens, our compatriots, who chose the medical vocation to serve those who suffer. No difference or distance can divide us by this commitment and this affiliation. We follow and we’ll follow with care and attention the situation." Last night on Italian TV: "The government is working because the truth prevails… there is no evidence that the three have confessed. I hope that the three compatriots leave free from all accusations of involvement." As if to say, Franco Frattini… a man all in one piece, a firm guarantee of security and authority for our country in the world. I support Emergency, but what about you, minister? What? Emergency is an international organization? Come on, don’t be demagogue. So, what questions are these? Who do you think I support?! The News: I support Emergency.